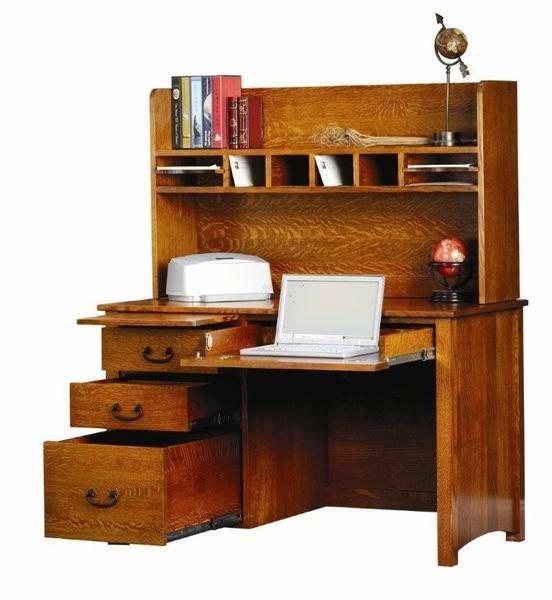 Our Amish Rivertowne Desk is a great little desk for any home office. This desk comes equipped with a file drawer as well as two smaller drawers for storage. If you are worried about not having enough space, the hutch top is a great addition to the desk that comes standard. The hutch top is a great organizer for your papers and other small desk trinkets. If you have any questions please call one of our friendly furniture specialists. They are happy to answer any and all questions you may have. The desk is shown in Quarter Sawn White Oak Wood with a Micheal's Cherry Stain.